Did you know apples can clean your teeth when a toothbrush isn’t handy? We've all heard the expression "an apple a day keeps the doctor away." But perhaps that should be changed to dentist. In addition to being good for your health, apples are also quite good for your teeth. In fact, if you find yourself without a toothbrush, an apple can fill in nicely. Apples can act like toothbrushes because of their fiber-rich flesh. This works like a scrub on not only your teeth, but your tongue and gums as well. 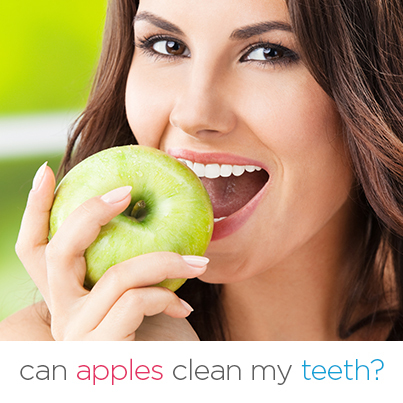 An apple can also help remove food particles that are hiding out between your teeth and sticking to your gums. As well as cleaning your teeth, because they are mildly acidic and slightly astringent, apples can also help get rid of plaque and stains. On top of that, apples can freshen breath. Is there nothing this super fruit can't do? The next time you have an after lunch meeting and forgot your toothbrush, head down to the cafeteria and grab an apple instead.